PianoQ, Software parametric EQ from Sound Magic. Sound Magic has announced the release of PianoQ, a new EQ for pianos. 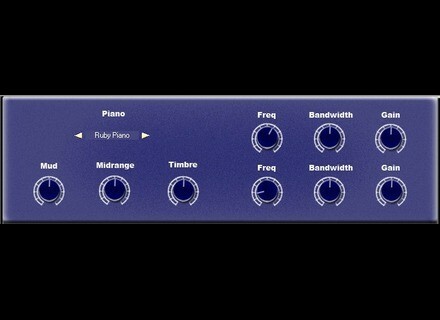 PianoQ is a 5-band parametric EQ. 3 bands are designed to tweak piano sounds while 2 are for free use by users. PianoQ can change a piano track's timbre to focus it exactly on the point, according to Sound Magic. PianoQ can function as a VST effect plug-in on Windows but its best use is to run as an add-on for Sound Magic Pianos, the company says. 3 specially designed bands only for pianos. AudioSpillage MiniSpillage Pro AudioSpillage has announced MiniSpillage Pro, a new AU plug-in for Mac OS X that takes the core drum modelling technology from the MiniSpillage plug-in and fuses it with a new sample playback engine and integrated on-board sequencing facilities. PropellerHead ReBirth v1.1 for iPad Propellerhead has released ReBirth 1.1 for the Apple iPad. AAS Updates Swatches Applied Acoustics Systems updates the free Swatches sound bank compilation for the AAS Player plug-in.